Pendulum clocks are generally known to produce a tick-tock sound that can usually be heard throughout the house. However, you might stop hearing this sound when the momentum of the pendulum changes or slows. 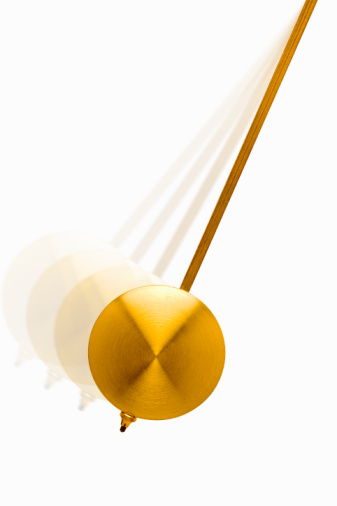 Most pendulum clocks contain adjustment or rate nuts that allow you to alter the length of the pendulum to either increase or decrease the amount of swing. It is relatively easy to adjust the pendulum on a clock if follow some simple instructions. Adjust your pendulum clock to the correct time and then set the clock on a level surface and check that it is wound appropriately or not. Then you need to swing the ball to the left for it to start. Now you need to check your pendulum clock after 24 hours against an accurate timepiece or computer. Note down how much faster or slower your clock is running. In case your clock is running two or three minutes slow or fast then you do not need to go to the next step. This is because many pendulum clocks are not designed to be more accurate than this. In case your clock is running faster or slower by more than five minutes, then you need to advance to the next step. Next you need to stop the pendulum and find the rate nut. It is usually located below the bob, (the round weight at the bottom of the pendulum). In case your pendulum is running fast then you need to slightly turn the rate nut to the left. As a result, the bob will be lowered and the pendulum’s motion will be slowed. In case the pendulum is running slow, you need to gently turn the rate nut to the right. This will cause the bob to go up and increase the motion. You need to continue turning the rate nut until you get the perfect timing. After adjusting the nut, your pendulum clock should be adjusted every one or two weeks. Remember to reset the minute hand whenever you adjust the clock or wind it.